St. Louis is known for their Italian food. We can’t get enough of it. I mean, toasted ravioli and mostacholi are staples in our house. There is even a part of town called The Hill with all of the best Italian restaurants St. Louis has to offer. We eat a lot of Italian and when can’t get out to our favorite restaurants, we recreate it at home. 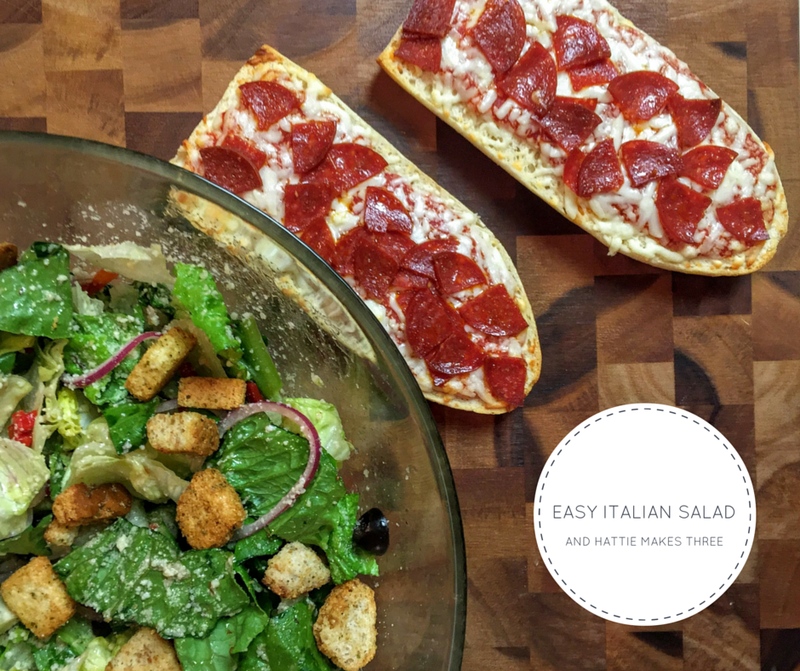 One of my favorite easy week night dinners is Easy Italian Salad and Red Baron Pizza. It’s perfect during the holidays when we are running all over! I feel like our calendars are booked solid every night this month. This salad is a tip of the hat to one of St. Louis’s most popular Italian Restaurants but with a few extra goodies added in. What I love is how the Parmesan cheese coats the lettuce. It’s just so good. Here is how I make it. 6) Top with croutons and Enjoy! I love serving Easy Italian Salad with Red Baron® French Bread Pizza Singles. This combo is perfect for a fun game night with friends, a quick family dinner or even a date night in. Pop a bottle of vino and grab a movie, maybe a holiday classic, and you’re set. Some would argue you’d also need garlic bread, but with the French Bread on the pizza, I don’t think you really need it. I pick up my Red Baron Pizza at Walmart in the single serve section of the Pizza aisle. Walmart makes the holidays and quick meals a snap since I can pick up all my ingredients in one place. I also love that with this salad I can buy extra of the pantry items, like the pimentos and artichokes because they go well with other meals, and I secretly love eating artichokes right out of the can! I like to keep a variety on hand. Each package has two individually wrapped French Bread Pizzas, so I can pop one for lunch if I am looking for a quick option. We like the Red Baron® Pepperoni French Bread Pizza Singles, Red Baron® 3-Meat French Bread Pizza Singles and also keep Red Baron® 5 Cheese & Garlic French Bread Pizza Singles on hand to use as garlic bread for pasta nights. Great way to use the pizza in a different way! The perfect dinner combo in my book. Quick, easy and a crowd pleaser. Now that I’ve shared how I make my holiday dinners easy with Red Baron, what are some of your favorite holiday eats? I LOOOOOVE Italian salads, especially with lots of artichoke hearts! That salad looks amazing and The Hill—yummmmm!!!! My husband and I still talk about the Pasta Bolognese we had there over seven years ago! Ha! I love the salad/pizza combo. Sounds like a great way to spruce up a boring old frozen pizza! This all looks delicious! This salad reminds me of an Olive Garden salad and I love those! Oooh, this looks and sounds delicious!